Number of Farm Based Manufacturers Has Doubled Since 2011 - New Promotional Efforts Announced at Long Island’s Harvest East End Wine & Food Classic. Albany, NY - August 25, 2014 - Governor Andrew M. Cuomo today announced that the number of farm based businesses manufacturing wine, beer, spirits and cider using ingredients grown in New York has increased by 100 percent since 2011. In addition, the total number of manufacturers producing alcoholic beverages in New York has increased by 105 percent since 2011. This growth is a result of the Administration’s efforts to partner with the beverage industry to create new farm based manufacturing licenses, launch new marketing and promotional initiatives, ease restrictive regulations, and reduce the time it takes to open a business. This weekend, Governor Cuomo also announced a number of initiatives to support this important industry, including a new advertisement will begin running this Labor Day. Additionally, the State will allocate $300,000 for further advertisements, events and transportation services to increase tourism around Long Island’s craft beverage industry. Building on existing relationships with Delta and Avis-Budget, this promotion will allow boarding passes and car rental/bus vouchers to be used for offers at wineries, hotel accommodations, restaurants and other businesses on Long Island. These offers will be available over targeted weekends in 2015. 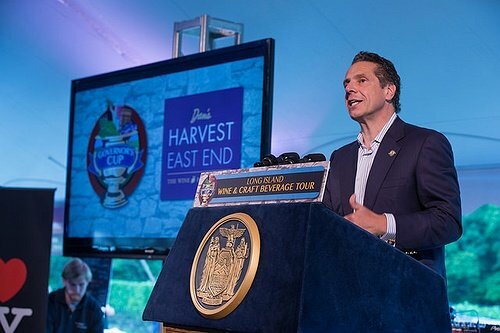 This weekend, Governor Cuomo attended the Harvest East End Wine & Food Classic to further raise the profile of some of the State’s best vendors and agricultural businesses. Video of the Governor’s remarks and b-roll from the event is available in TV-quality (h264, mp4) format here and on YouTube here. Photos from the event are available here. The $300,000 promotional initiative announced this weekend will build on the I Love NY campaign’s existing partnerships with the MTA and Port Authority, focusing on JFK and LaGuardia airports, the Airtrain and platform advertising on sections of the Long Island Railroad, in order to reach potential visitors already traveling to or through New York City. In addition to the substantial tourist market linked to New York City, online and print advertisements will also target key international travel markets in Canada, Europe and Asia that have been shown to be dependable export hubs for craft beverage products from New York and the U.S. Based on a correlation between high rankings for annual tourist visits to the New York City area and per capita wine consumption and wine imports, the countries with identified potential are Canada, the U.K., France, Germany, China, Japan and Sweden. Fifty-seven new Farm Breweries have opened up across the state as a result of Governor Cuomo’s 2012 Farm Brewery law that went into effect in January 2013. Like Farm Wineries, Farm Breweries must use specific levels of locally grown ingredients. Farm Breweries enjoy similar privileges to Farm Wineries, including the ability to open up to five offsite retail outlets, open restaurants, conduct tastings and sell related products, including souvenirs, food to complement beer tastings, and equipment and supplies. As Farm Breweries continue to open across the state, the demand for locally ingredients has likewise grown. In addition to the fifty-seven new Farm Breweries, New York microbreweries continue to experience unprecedented growth. The Empire State is now home to 104 microbreweries, a 160 percent increase from 40 in 2011. Additionally, the number of restaurant brewers or brewpubs, has increased from 10 in 2011 to 33 today, a 230 percent increase. Since 2011, the number of farm wineries has risen by nearly 50 percent, from 195 in 2011 to 291 today. In addition, the number of Farm Wineries opening branch offices, authorized by legislation signed by Governor Cuomo in 2011, has increased by 90 percent, from 29 in 2011 to 55 today. The number of wineries has also increased by 50 percent, from 52 in 2011 to 78 today. In addition to this substantial growth, New York’s wineries have also had a banner year in terms of quality. In 2013 alone, wineries in the Empire State won more than 700 awards – the most in any single year in state history. In October 2013, Governor Cuomo capitalized New York’s designation as the country’s second largest producer of apples to implement legislative changes to further promote this important agricultural industry by creating the Farm Cidery law. The new law, that went into effect on January 15, 2014, has led to the creation of seven new Farm Cideries. Farm Cideries manufacturer cider made exclusively from apples and other pome fruits grown in New York State. Like Farm Wineries and Farm Breweries, Farm Cideries also enjoy additional privileges and are allowed to offer tastings of and sell not only cider, but also beer, wine, and spirits made from New York products. With the addition of the seven new Farm Cideries, New York is now home to 29 hard cider manufacturers, an increase of 480 percent from 5 in 2011. Since 2011, the number of Farm Distilleries in New York State has increased 450 percent, from 10 in the 2011 to 55 today. In October 2012, Governor Cuomo signed legislation to allow licensed Farm Distilleries to sell their liquor at the New York State Fair, recognized county fairs, and not-for-profit farmers' markets. This new law is helping local farms to grow by providing distilleries with marketing opportunities previously offered exclusively to licensed wineries, farm wineries, and farm breweries. On May 9, 2014, 34 New York craft distillers participated in the Manhattan Cocktail Classic’s Opening Day Gala at the New York Public Library, one of the spirit industry’s premier events. This is the second straight year that Taste NY has sponsored the NYS Distillery room at the Gala. In addition to legislative and regulatory improvements, the State Liquor Authority has also cut the processing time for new manufacturing licenses in half. In 2010, it took the SLA an average of 83 days to review new manufacturing licenses, today the review time takes just 38 days. For more information about New York’s growing beer, wine, spirits and cider industries, please visit taste.ny.gov. Subject: LongIsland.com - Your Name sent you Article details of "Governor Cuomo Announces Significant Growth in New York’s Wine, Beer, Spirits and Cider Industry"